This would have best context, for those living in Karachi. But, others would also get the main message. With the rising temperature in Karachi, in the recent past (June 2015), going as high as breaking record (45oC), which was exacerbated by the government’s water and electricity shortfall, that some 1000+ souls lost their lives in this big metropolis. 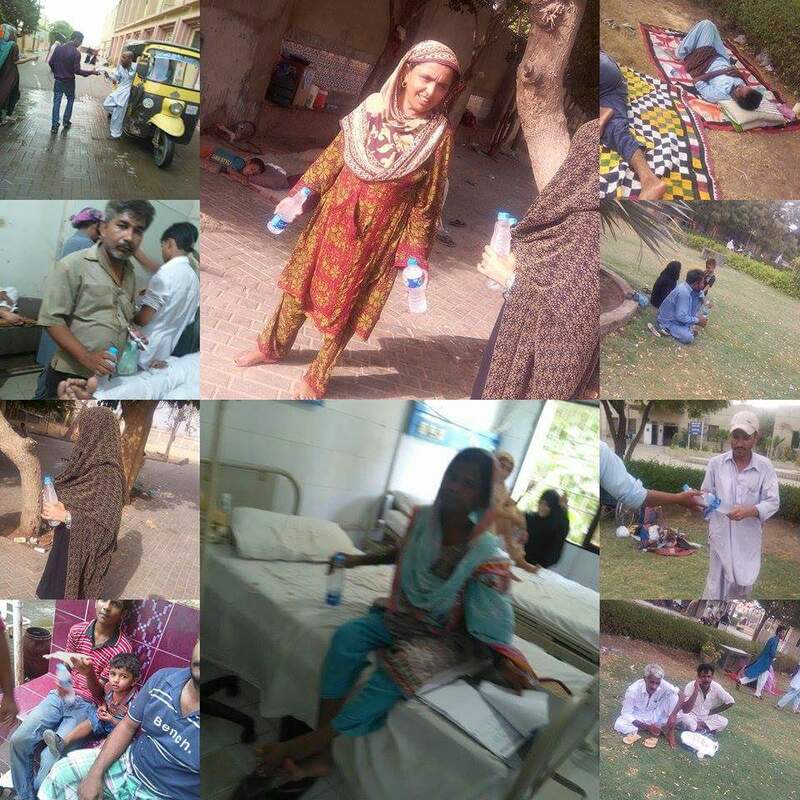 Most of them were either chronically ill or drugged and rest lacked awareness about heat-stroke, but it was no less than a tragedy for the city, in recent times. 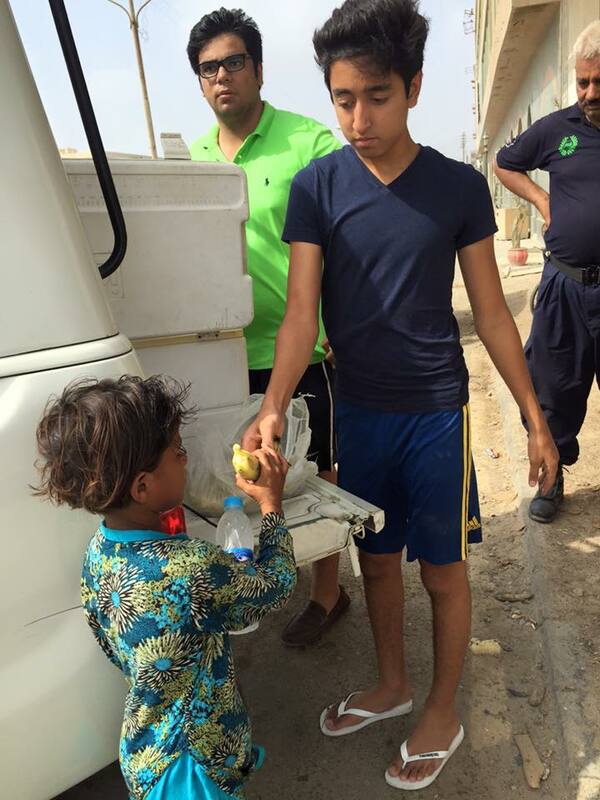 I wrote another post on heat stroke and how to respond in such situation, here. Thanks to God, who has provided us with this government and KE, KWSB, KMC, WAPDA, Karachi Meteorological Department and Sindh Police, Civil/Jinnah Hospital and PIA, etc., without which we couldn’t have gained piety in this holy month of Ramazan. This is a sarcastic statement, but they really tested our patience. How could people (eg living in first world countries), in relative quiet time and peaceful living, get the chance to demonstrate patience and tolerance, when everything is easy for them. You know, many of those people (living abroad), run into a situation where they can’t find enough people eligible for ‘zakat’ (person living below poverty line), people under stress, and destitute families, that they have to turn to the third-world countries, to fulfill their obligation of zakat (giving alms). Both the people with the means and luxuries of life are tested (‘Ibtilah’) and also those who are living in poverty. But, God tests more the pious people, so as to test the strength of their faith and to give them a chance to increase their level of ‘taqwa’ (piety). Indeed, in order to earn such blessings, we have to observe patience and not get agitated, under any circumstance, like that which Karachiites (specially the poor) are enduring through lack of basic essentials like water and electricity, the trouble of getting CNG, increased beggary, raging traffic and the rising mercury level. So, those who did observe patience and those who got martyred through the heat-wave, mugged, or endured heat or lost someone/something dear to them, and did not complain and observed ‘sabar’ (patience) and remained thankful to the blessings of Allah, must have gained His ultimate favor. Although, it wasn’t wise to observe ‘fast’, during those extreme heat-wave period, specially for the weak (who are exempt anyways) and impoverished (who risk their lives), and specially when the government was adding to their misery, failing to provide electricity and water. I have written another post on how to avoid, identify and recover from heatstroke. But, I am sure, who did fast naively and with the sole ‘neeyat’ (intention) of gaining Allah’s favor, would definitely get their reward. During Friday sermons/prayers, I noticed lots of people, under open scorching sun, stood perspiring from head-to-toe, saying prayers. That’s indeed a great sight, of the level of faith in the society, under such tough circumstances. 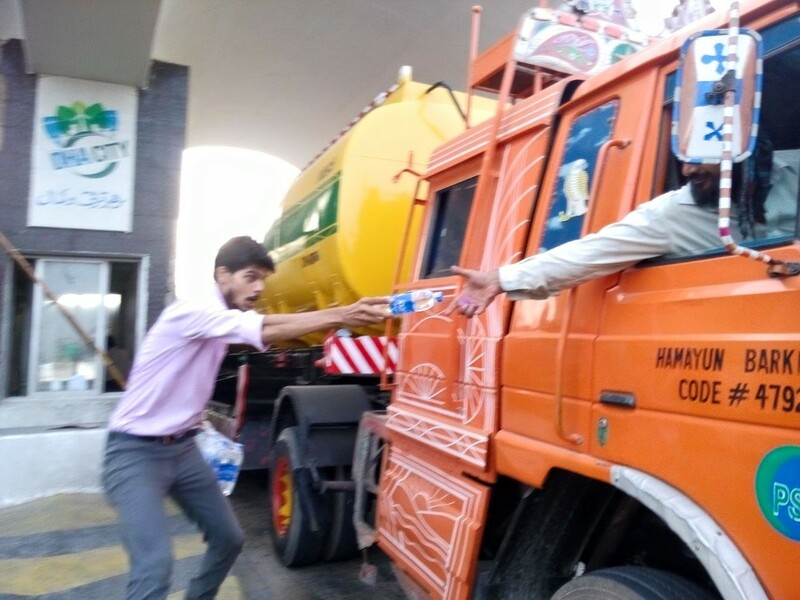 Such, calamity also provides us the opportunity to perform those acts of kindness that I noticed many people of Karachi demonstrated, by volunteering to provide drinking water with ORS (necessary salt) to hundreds of thousands of people in shantytown and hospitals, across the city. 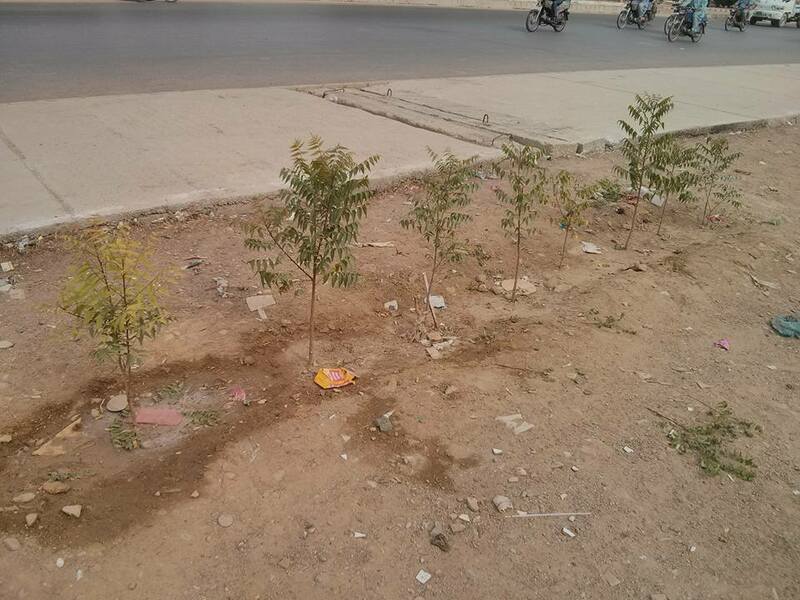 The noble acts of planting trees (Neem tree) followed, which is a ‘sadqa –e- jareeha’ (eternal reward). 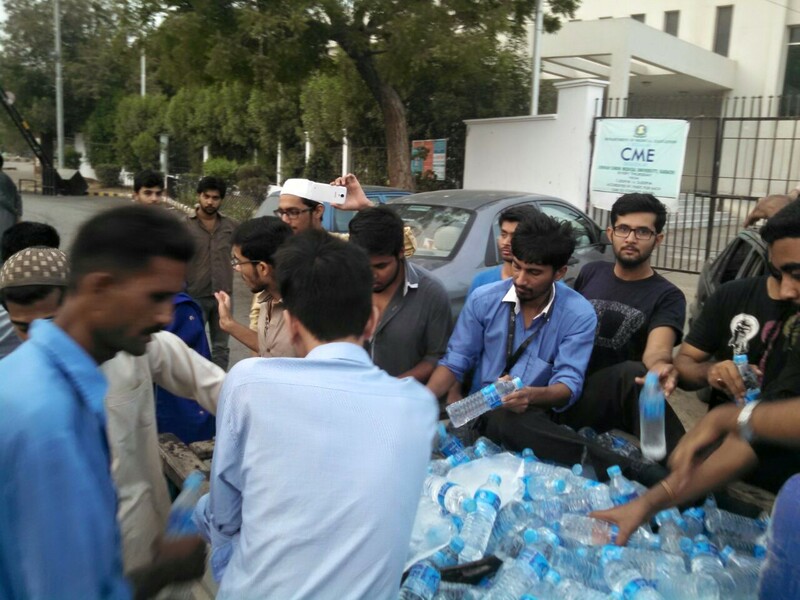 Everyone volunteered either with their money, or time, effort, awareness or encouragements, in whatever manner they could, to serve their fellow Karachiites. Acts of kindness and sacrifice, when you have plenty to share or when you are trouble-free, is obviously easy. One of the reasons for fasting in the month of Ramazan, apart from giving a break to your body, is to feel for the poor, who are hungry and thirsty and learn to observe control without any discontent. If we are awake all night, eating or just hanging around with friends and sleeping next day in AC, or remain in AC anyways, you’ll still fulfill the obligation, but you will miss to observe hunger or thirst and a feeling for the poor. Similarly, in the middle-east, it’s common these days to see temperatures has high as 40-50oC. 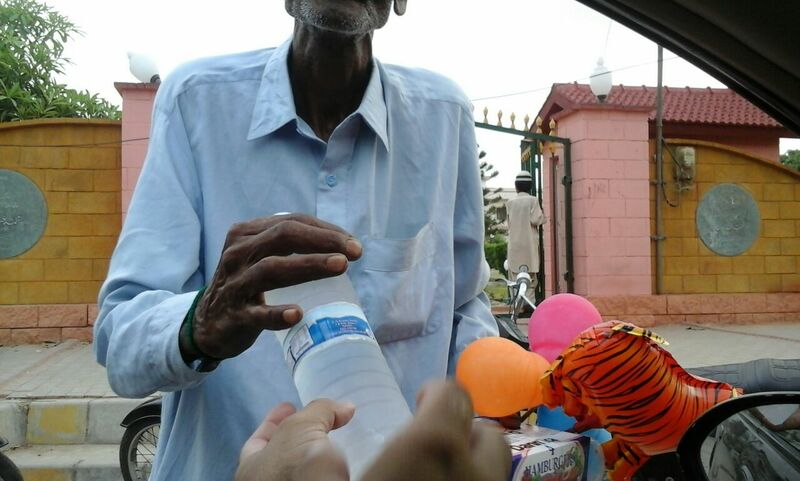 But still, you don’t get such opportunity of giving and sharing with the impoverished, that you get in Karachi. So, the real metal is proven, when under such dire circumstances, Karachiites showing their heart for such immense level of brotherhood, is a pleasant sight, something we must be thankful for. Pakistan is known for its philanthropy and the month of ramazan sees its phenomenal rise, where you see hundreds of thousands of people giving charity, by providing free ‘iftaar’ (food boxes), arrange places for ‘taraweeh’ (evening prayers), give free ration to the hungry, give cash to the poor (‘zakat’) and donations to hospitals and charity organizations, was overwhelming to observe in this Ramazan. Somehow, such information is never highlighted in the news. The reason, I almost stopped turning TV on. 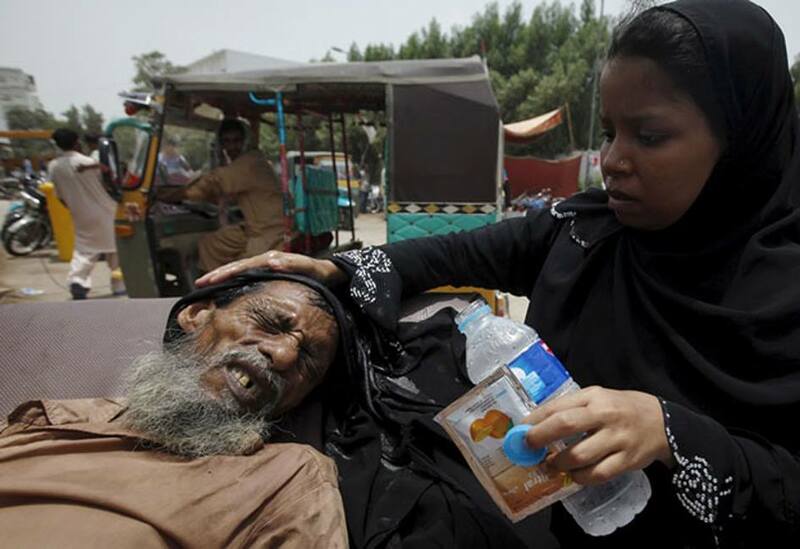 Last but not the least, such acts of nobility aren’t complete, without the mention of Abdul Sattar Edhi’s Edhi Foundation, who provided funeral services to the sudden death of hundreds of people during the peak heat-wave, which no one was able to handle, government, least bit. Our leaders (in the government) should understand their job is to serve and to protect, and not to rule us. There is a painful hellfire waiting for them, if they neglect their duties and let such a magnitude of people suffer like that. But, anyhow, it turns out to be a blessing in disguise, where it provided us the opportunity to expiate our sins and reminded us of the true path. So, we should observe patience under any circumstance and do good to others, in the best way you can. But that does not mean no accountability for the leaders (government officials), responsible for this debacle. Part of the ‘sabr’ (patience) is to stop them from committing this hardship on the people at large. It’s also our responsibility to protest. It’s indeed same as committing oppression, when you bear oppression and does not voice your concern or fight back. May Allah, grant maximum reward to these people who served their fellow beings (‘huquooq ul ebad’) and give us ‘sabar’ (patience) and strengthen our faith during such difficult times and save us from actual calamity and give us ‘toufeeq’ (guidance) to make the most of this month, so that we get your ultimate favor, Aameen! May Allah, also give guidance to our leaders (in government) and save them from hellfire, Aameen! Verily we belong to Allaah and to Him we shall return. O Allaah help me in my calamity and bring me something better in return, Aameen! * Many of the photos, I’ve taken myself and many I’ve gathered from volunteers on social media. Haves and Have Nots: Who’s responsible ? Around 400,000 such persons (lying on the street above) can be fed for a day, with the amount of money spend on this car. If you love cars, that’s one thing, but otherwise, are you part of this income disparity or against it ? Now, check out following Income disparity comparison around the world. Red being greater inequality and Blue less and Purple in the middle. Ever wondered, why we see vast difference between haves and have nots, in almost every country. Rich are filthy rich (no offense), while poor living in extreme poverty. Rich throw half of the food eg in Saudi, when they’re full, while poor eat half meal to their satisfaction, once a week in Somalia. Some have made cars with gold, while others spend their life pondering how to accumulate gold for their girls marriage in India. Some go on vacation in Spain with entourage of more than 3000, while others save money his whole life to perform Haj (Pilgrimage) travel to Makkah, with two or three family members. Pakistan’s 36,000 elite millionaires owns 40% of Pakistan’s total wealth (Rs. 2,118 billion) as per SBP report. I remember, in 2011, US dumped food worth $6 billion, because it doesn’t want to disrupt global food price, if it gives on charity to any country. The richest 1 percent of the population received almost a fifth of the national households’ income in 2012, thus breaking the previous record set in 1928. 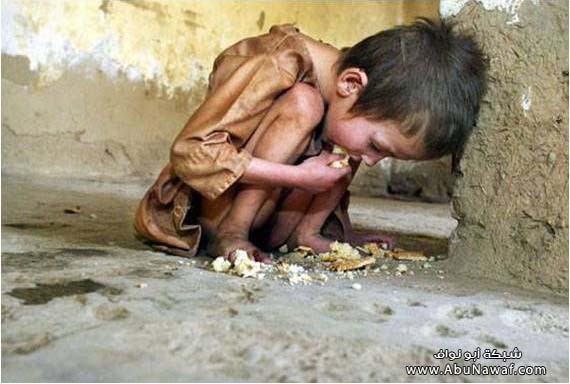 870 million people worldwide do not have enough food to eat. The poorest 40 percent of the world’s population accounts for 5 percent of global income. The richest 20 percent accounts for three-quarters of world income. 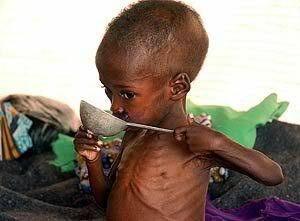 According to UNICEF, 22,000 children die each day due to poverty. We normally pay 10 times more on a meal, while we can eat ourselves modestly and instead feed 9 people with rest of the money. Now take a look at the situation of debt of the majority of population and find how it’s skyrocketing for the poor and falling for the rich. This clearly tells us that rich are getting richer and poor are getting poor. I heard ‘Interest’ or what we call it as ‘Riba’ has such effect ? Following data is from US trends, to elucidate the point, rest of the world has similar picture. Now look at the income disparity graph as an example from US, over the decades and see how the Top 1% progressed in it’s income and how the bottom percentiles have remained subdued, effectively increasing the divide between haves and have nots over those years. Picture speaks a thousand words, I’ll leave following photos to your imaginations. Did that happen all of a sudden ? Why did that happen in the first place ? Should we hold ‘Haves’ accountable or are the ‘Have nots’ culprit themselves ? Zakaah al-Fitr is often referred to as Sadaqah al-Fitr. Sadaqah al-Fitr is a duty which is Waajib on every Muslim, whether male or female, minor or adult as long as he/she has the means to do so. The main purpose of Zakaah al-Fitr is to provide those who fasted with the means of making up for their errors during the month of fasting. Zakaah al-Fitr also provides the poor with a means with which they can celebrate the festival of breaking the fast (`Eid al-Fitr) along with the rest of the Muslims. Zakaah al-Fitr is only Waajib (obligatory) for a particular period of time. If one misses the time period without a good reason, he has sinned and can not make it up. This form of charity becomes obligatory from sunset on the last day of fasting and remains obligatory until the beginning of Salaah al-‘Eed’ (i.e. shortly after sunrise on the following day). However, it can be paid couple of days prior to the `Eid’. The amount of Zakaah is the same for everyone regardless of their different income brackets. 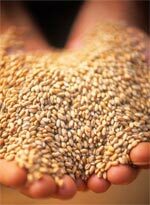 The minimum amount is one Saa` (two handfuls ) of food, grain or dried fruit for each member of the family. Typically calculated as 2kg of barley, which is equivalent to Rs. 100 per person (in Pakistan, for 2015). It’s also said that if you can afford, you can give Rs.1280 (as per dates value in 2014) per person or more, but Rs. 100 will fulfill your obligation. Who so ever is eligible to take Zakat, can take Fitr (commonly known as Fitra in Pakistan) as well. I wrote another post on Zakat. It is a month of ‘ramzam’, where our good deeds are multiplied manifold for its rewards, so consequently, majority of muslims give their ‘zakat'(alms) in this month. I see a plethora of ads, billboards, pamphlets where they are requesting for zakat money. No doubt, pakistanis are most philanthropists, but everyone seems to be jumping to cash on it. We should remember, that zakat should be given in the form of money, so that the receiver has the complete authority to spend it the way he/she likes, ie to fulfil any of his/her most important need. Or in other words, you cannot buy food, or goods with zakat money and give to these poor people. The idea being, Zakat is poor person’s right, not something you give to oblige him/her, it’s their right. Unlike zakat, you are free to give other charities, and how much you want to give and in what form you want to give, eg charities like ‘sadqua’, ‘khairaat’, etc. But ‘zakat’ is obligatory. Let me brief you about its basic rulings for Zakat. I have included only common points, while skipping others. Obviously I could not cover this topic comprehensively in one blog post, so don’t take this as comprehensive guide to cover every scenario. However, I will share link at the bottom, should you need to read further. Linguistically, ZAKAT has two meanings: purification and growth. Technically, it means to purify ones possession of wealth by distributing a prescribed amount to the poor, the indigent, the slaves or captives, and the wayfarer. It is obligatory for an adult who has saved more than *87 grams (7.5 tola) of gold or it’s equivalent cash or assets (that grows in value), continuously over a period of a year. * 87 grams of Gold is ‘Nisab’. 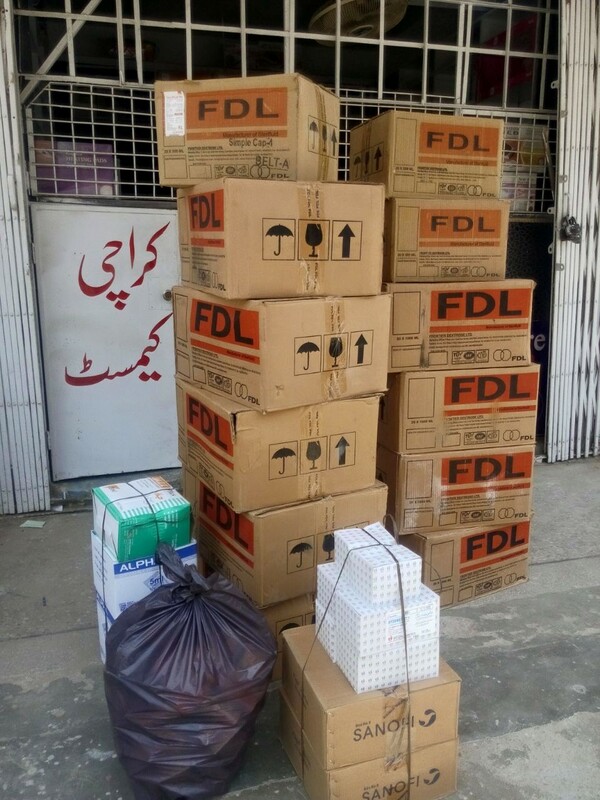 Fuqaraa: Those who own property in excess of basic necessities but below the value of Nisab. Masakeen: Persons of extreme poverty who possess no wealth whatsoever. Aamileen: (Zakat collector) Those persons who are appointed by an Islamic Head of State or Government to collect Zakat. It is not necessary that this be a needy person. Muallafatul Quloob: Those poor and needy persons who are given Zakat with the intentions of solidifying their hearts because they maybe recently converted to Islam or to bring them closer to Islam. Al Ghaarimeen: A person whose debts exceeds his assets and his net assets (after deducting his liabilities) is below the Nisab limit. To determine whether a person qualifies, his basic necessities of life (house, furniture, clothes, vehicle, etc.) will not be taken into account. It is conditional that the debts were not created for any un-Islamic or sinful purpose. It reminds Muslims of the fact that whatever wealth they may possess is due to the blessings of Allah and as such it is to be spent according to the His commands. Zakat functions as a social security for all. Those who have enough money today pay for what they have. If they need money tomorrow they will get what is necessary to help them live decently. Zakat payer pays his dues to Allah as an act of worship, a token of submission and an acknowledgment of gratitude. The receiver of Zakat receives it as a grant from Allah out of His bounty, a favor for which he is thankful to Allah. Economically, Zakat is the best check against hoarding. Those who do not invest their wealth but prefer to save or hoard it would see their wealth dwindling year after year at the rate of the payable Zakat. This helps increase production and stimulates supply because it is a redistribution of income that enhances the demand by putting more real purchasing power in the hands of poor. Who cannot be given Zakat? What kinds of things require paying Zakat on them? I remember, someone gave me Rs. 10,000 (=$100) for food charity (food distribution to the poor, I run with my friends). Some 300 poor people satisfied their hunger for one time, with that much money. Imagine, how many had their meals with Rs. 26,000 (=$260) and so on. But the point is, we can easily spend Rs.10,000 in a group of 8 people, for one meal at any buffet (eg iftaar, lunch or dinner), so compare that with a meal for 300 people. Extravagance – is to exceed the limits of what is required or what is customary. We should not spend wastefully in the manner of the spendthrift. 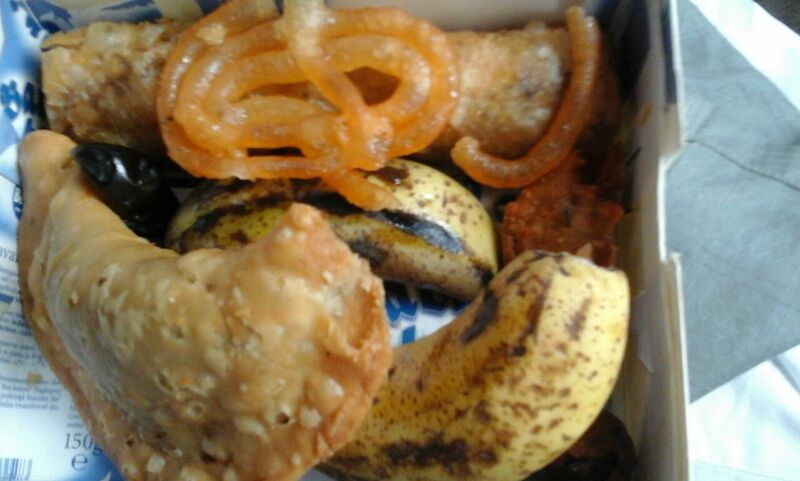 Eat and drink but not waste by extravagance. As you know, extravagants are considered the brother of evil. And we should also not be miser, in fact when we spend, we should neither be extravagant nor niggardly (scrimy), but hold a just (balance) between those (extremes). It does not relate to food or eating, instead we should avoid being extravagant in all matters, eg in drinking, clothing, conversation, spending, sleeping, hygiene, laughing, joking, praising, criticism, prayers (ibadat), in fact we should choose the path of moderation in virtually every part of our life. The method of determining whether or not an action is extravagant is to consider whether it exceeds what is needed or exceeds what is customarily regarded by the people to be within acceptable limits or common in the society or people with your same stature. If we (blessed to be rich) observe these practices in our life, there would not be this much of a poverty in our neighbourhood, cities, countries and planet earth, that we see today, the extreme economic disparity in our society. If everyone abstains from excesses or lavish lifestyle and instead share extra money to the less privileged and thus does his/her part in charity, according to his/her capacity, we would have removed poverty and hunger from the world and it would be a lot happier place. Bless you all! The passion of acquiring riches in order to support a vain expense, corrupts the purest souls. A bedroom requires a bed. Everything else was extravagance. Well, he had a bed all right. If extravagance were a fault, it would not have a place in the festivals of the gods. An extravagance is something that your spirit thinks is a necessity. He who buys what he needs not, sells what he needs. Prodigality is indeed the vice of a weak nature, as avarice is of a strong one; it comes of a weak craving for those blandishments of the world which are easily to be had for money. I have always read about the generous philanthropic nature of Pakistanis in general and specially from the ones who leave the country but still tend to give back, as soon as they have the means. My first such experience was during the disastrous earthquake of 2005 in the northern area of Pakistan, when I saw hundreds of thousands of people from Karachi flocked in the PAF Museum, to donate and provide volunteer help to sort the goods and help in loading on the trucks, planes, helicopters borne for the relief areas. The area as big as a park, was fully covered with clothings, food items, clean water bottles, utensils, etc. That was phenomenal, especially looking at the fact, that people in Karachi have to face high inflation and many already face difficulty to make both ends meet, yet everyone was sharing wholeheartedly, at the time of need, in whatsoever way, they can, to support 3.5million people who were displaced during that earthquake. Recently, I had another first-hand experience, where I simply posted on my facebook status, that a group of 4 friends have setup a simple food subsidy program, to feed the poor living right besides their neighbourhoods in Karachi, in the ‘jhughyain’. Friends flocked in messaging me on FB, saying they want to contribute and many of them from outside pakistan, asking how to send money. 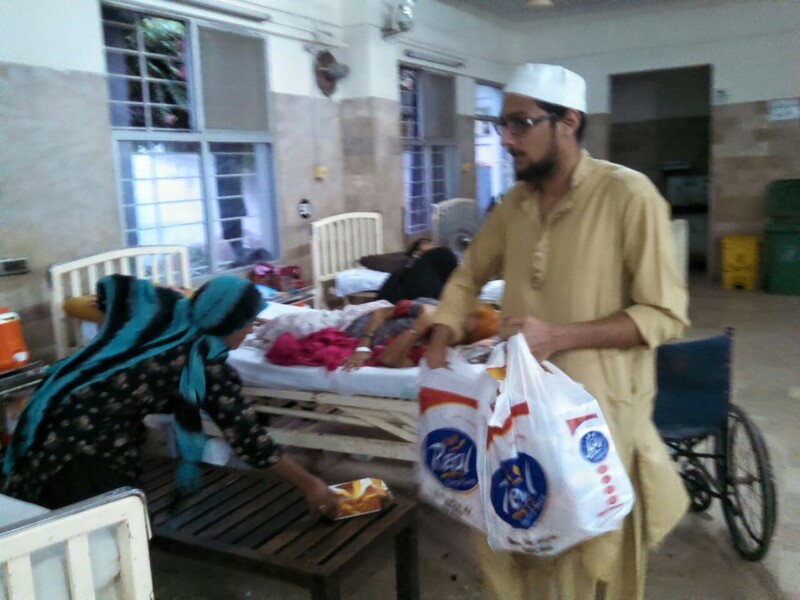 It was overwhelming to notice, how most of the pakistanis feel about others in need. Accordingly to an old article by Khadeeja Balkhi in the DAWN news, in 2000, Pakistanis gave $1.2 billion, or Rs 67.7 billion, in charity. Pakistan is ranked the sixth most philanthropic country in the world, according to the Pakistan Centre for Philanthropy (PCP). The PCP’s pioneering study in 1998 showed that total giving by individuals was equivalent to 17 per cent of the year’s national revenue. Apart from the element of religion, which says to gives alms in the form of ‘Zakat‘ (obligatory) and charity in the form of ‘Sadqa’ (volunteer act), Pakistani has a generous heart, because they know government does not fulfil it’s responsibility effectively, leaving many at the helm of capitalist system, where nothing moves without money. That makes it even more important for individuals to help the have-nots themselves. Many of the people also have gone through that time of struggle and misery and then God blessed them with the means and resource for a prosperous life, so they tends not to forget that time and naturally show kindness to the poor. We have so many big names, like Abdul Sattar Edhi, Hakim Saeed, Ansar Burney, Agha Hasan Abedi, Nadirshaw Edulji Dinshaw (NED), etc. and so many organizations like TCF, Alamghir Welfare Trust, Fatmid Foundation, and so many others. 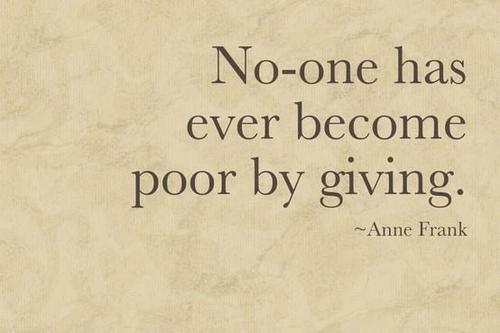 Indeed, Pakistanis carry a generous heart, for helping their fellow beings. The best charity is to satisfy a hungry person”. “No wealth (of a muslim) is decreased because of charity.”. “Anyone who has property that exceed his needs, let him support someone whose property does not (meet his or her needs), and anyone whose food exceeds his needs, let him share it with someone who does not have food.“. Overt, covert and back to overt fighting? Why Muslims act cautiously abroad ?